Since 2011, the CFPB has handled over 91,000 complaints from servicemembers, veterans, and their families (which we refer to collectively as “servicemembers”). This is an average of over 15,000 complaints each year. Our 50 state snapshot of Servicemember complaints provides a national overview of those complaints, as well as a snapshot of complaints from all 50 states, the District of Columbia, and the U.S. territories, commonwealths, and freely associated states. Servicemembers are more likely to submit complaints about debt collection when compared to non-servicemembers (39 percent of all complaints from servicemembers are about debt collection, compared to 26 percent from non-servicemembers). Servicemembers are less likely to submit complaints than non-servicemembers about the other top four types of complaints, such as those related to mortgages and credit reporting. Complaint data also show how the experiences of servicemembers can be different depending on where they live. For example, in California, servicemembers submit more complaints about debt collection than any other product. 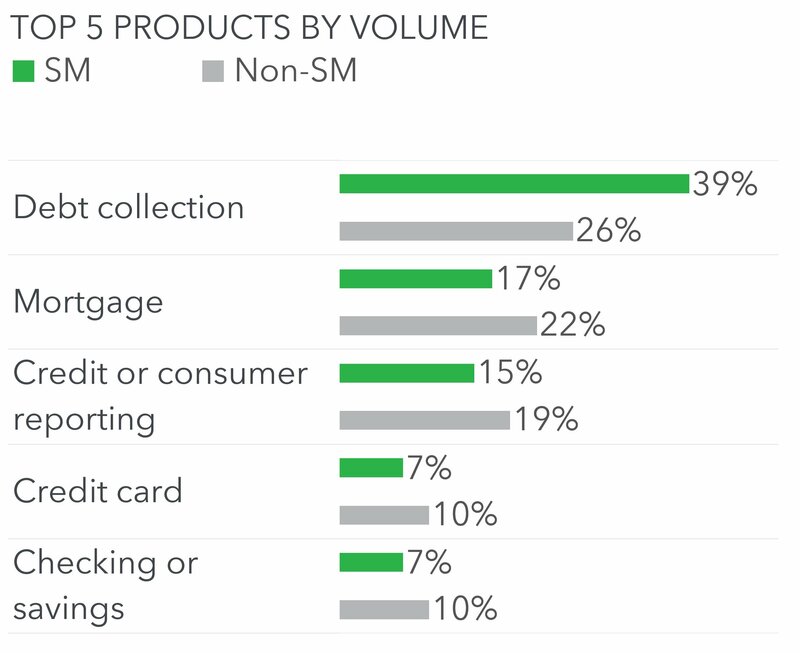 In North Dakota, the most common complaint is about credit or consumer reporting. Complaints submitted to the CFPB show the range of problems that servicemembers and their families have experienced with financial products and services. These problems can affect their professional lives. For example, servicemembers continue to report prohibited practices such as debt collectors calling their superiors about debts without authorization. When consumers submit a complaint to the CFPB, we forward their complaint to the company—generally in less than one day—and work to get the consumer a response—generally within 15 days. Companies have provided a timely response to 97 percent of servicemember complaints sent to them by the CFPB. We monitor and analyze these complaints, watching for trends and working with other federal and state agencies to strengthen financial protections for military families. Financial concerns can distract from military readiness for servicemembers being asked to serve our nation at home and abroad. To ensure that we are doing our part, we will continue working to understand their financial problems, bringing these concerns to companies, and finding new ways to serve the people who are bravely serving us.